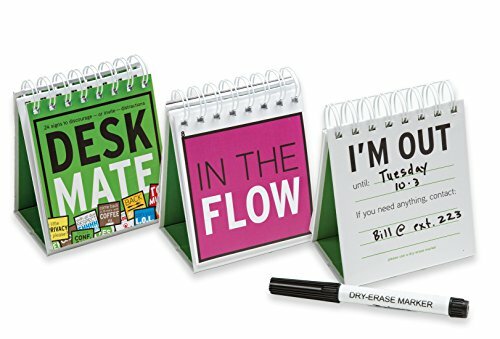 DeskMate 24 Desktop Flip Signs, Office Cubicle Accessory to Discourage or Invite Distractions by Office Oxygen at Transparent University. MPN: CLTDDM. Hurry! Limited time offer. Offer valid only while supplies last. These 24 flip signs discourage (or invite) distractions in various settings from offices and reception areas, to cubicles and management offices. These 24 flip signs discourage (or invite) distractions in various settings from offices and reception areas, to cubicles and management offices. Need time and space to get stuff done? The 24 playful yet direct DeskMate signs let you tell people to GO AWAY -- nicely. The signs say it (from the front and back), so you don't have to! And, as a special feature, the back of the book can be written on with a dry-erase marker (not included), allowing you to leave a note about when you expect to return! Whether you're in training, participating in a webinar, or just trying to get work done, they're perfect. 5 signs to signal that you're open and available - to catch up, have an impromptu meeting, or whatever. 14 direct, yet friendly, signs to let colleagues know you're concentrating, in the zone, on a lengthy call, or need some peace and quiet. 5 signs to let your team know if you'll be away from your desk for a long time or will be back shortly. 24 total signs that let coworkers know if you're too busy to talk or available. Unique signs say it from the front and back, so you don't have to. Great for busy people who need away time to get things done in an Open Office setting. Dry Erase marker NOT included. If you have any questions about this product by Office Oxygen, contact us by completing and submitting the form below. If you are looking for a specif part number, please include it with your message.